The Boeing 747-8 is a wide-body jet airliner developed by Boeing Commercial Airplanes. Officially announced in 2005, the 747-8 is the fourth-generation Boeing 747 version, with lengthened fuselage, redesigned wings and improved efficiency. The 747-8 is the largest 747 version, the largest commercial aircraft built in the United States, and the longest passenger aircraft in the world. See Boeing 747-400 Tutorial for the main article about this subject. All buttons/switches in the cockpit can be controlled using the mouse. Most buttons exist of a toggle, where clicking it toggles it either on or off. Switches can be turned clockwise with the left mouse button and counter clockwise using the middle mouse button. Some buttons/switches have a cover on them, clicking it will either open or close it, so the button/switch can be pushed/turned. Several panels are also available as 2D overlay panels. Clicking the hydraulics or electric overhead panels will open up a 2D variant. Useful when you'd like to keep an eye on the EICAS during startup! You can close the panel via Shift-P. Important notice: as of FlightGear 2.6.0, the 744 has tiller steering, just like the real aircraft where the pedals only turn the nose wheel by a few degrees - to achieve optimal precision during takeoffs and landings. Use the tiller (747-400 > Tiller Steering) dialog to steer during taxiing. Finally, you can also disable the separate tiller control and revert to the unrealistic behaviour of using pedals only to completely control the nose wheel (see 747-400 > Tiller Steering dialog). Currently the pilot monitoring really cannot do anything else than monitoring. All switches and controls must be operated by the pilot flying. Pilot flying: launch the 747-400 as usual. Pilot monitoring: launch the 747-400-fo (First Officier) and position yourself somewhere close to the PF's positions. 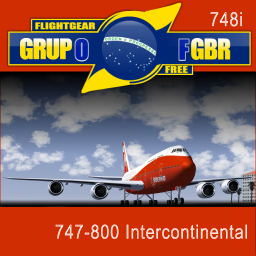 Now open the Boeing 747-400 > Select MP-pilot dialog and click the prefered PF's callsign. Press the continuous ignition switch on the overhead panel. Pull the start select switch for engine #4. Set the cutoff switch on the pedestal to RUN. Now repeat step 2 and 3 for engines #1, #2 and #3. Set flaps to 20, it will take a minute to extend, so you'd better do this during taxi. Push the stick slightly forward until atleast 80 kts. Around 160 kts, slowly pull the stick back to rotate. Rotate toward 15° pitch attitude. The plane should takeoff around 180 kts. Retract gear as soon as the aircraft is climbing with atleast 500 ft per minute. At 10000 ft MSL set the inboard landing light switches to ON. Set the flaps as directed by the flap extension schedule. Set flaps to 25 or 30. Set all fuel cutoff switches to OFF. This page was last modified on 21 July 2016, at 08:12.